The book offers familiar Western foods lovingly prepared with Ayurvedic principles. Learn how to cook fresh, easy to make recipes for healthy folks, as well as those with illnesses, including allergies and candida. This book is certain to open wide the door to this ancient East Indian, yet universal system of healing and nourishment, with more than 230 new and delicious Ayurvedic recipes. Amadea Morningstar is graduated in B.S nutrition and food sciences from Berkeley. She currently writes about Ayurvedic medicine and earth healing. She has authored or co-authored three books. She was in practice for twenty years in the healing arts, as a nutritionist and counselor. She also teaches and illustrates. They say let your food be your medicine and in Ayurveda this is a core component of the path to health. 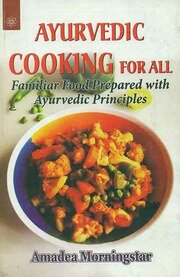 Many people ask me to recomend Ayurvedic cook books and this is surely one of my favorites! Enjoy! Not only is it healthy but super tasty too! They say let your food be your medicine and in Ayurveda this ..